Along with many other reviewers and sneaker aficionados, I anticipated the release of the Rose 5 as much or more than any other this year – mostly due to the implementation of full length Boost for the first time ever in a hoops shoe. The Crazy Light Boost experimented with heel Boost only, and in my only try on in-store the forefoot felt so terrible I couldn’t justify spending my own cash on it (we pay for all reviews out of pocket). But I was going all in on the Rose 5, and a little unsure of what to expect. Running shoes featuring Boost foam were pillowy soft and bouncy – great for linear activities but not so much for the dynamic movements and change of direction that come with the game of basketball. The Boost setup in the Rose 5 though, is fine-tuned for the hardwood and is actually only a small part of what makes the 5 one of my favorite shoes I’ve put on my foot this year. I went a half-size down to an 11 and found the fit perfect for my foot, with just the right amount of length and a very sung lateral fit. I’ll throw Boost aside for a second, because the tremendous fit and lockdown is the best aspect of the Rose 5. The shoe features a SprintWeb upper with a Fitcage structure along the medial and lateral sides. Fitcage is a frame of sorts, holding the sides of the foot in place, wrapping around the heel with a substantial external heel counter, and extending up to the collar around the ankle bone. It’s stiff yet still molds with the foot and locks the foot in place. There’s not even a hint of slippage, even with my narrower foot. It’s every bit as secure as the best fitting shoes I’ve tested – the Clutchfit and Crazyquick 1 – and provides extra security against ankle inversion. I’ve seen some criticisms of the synthetic upper material for its excessive creasing in the toebox. And it definitely does crease immediately, but I didn’t find it affecting the performance in any way. It may affect wide footers that take up more of the toebox volume, but I doubt that it’s a significant thing. I found it creasing in the normal areas that any Fuse or Frame type of upper would, and the shoes laced up with vise-like lockdown from toe to ankle. I didn’t notice any hotspots, and while it’s not a natural feeling upper like the Crazyquick 1, XX9, or Clutchfit, it’s as secure as anything out there. Much like the Rose 4.5 achieved great lockdown despite having a more stiff upper, the Rose 5 is near-perfect for all intents and purposes. For what it’s worth, other colorways appear to have a SprintWeb mesh upper rather than the thicker SprintWeb synthetic found on this “Brenda” colorway. These may crease and fit a little more naturally than the colorway I picked up. The full length Boost midsole is spongy and smooth, and transition is aided by a large stability plate underneath the arch with four fingers extending to the forefoot and heel portions of the shoe. With the translucent outsole, you can easily see this plate sandwiched between the outsole rubber and Boost midsole. Transition was perfect, especially after a couple of wearings. Boost is one of the hottest technologies in the industry, and has to be one of the most unique cushioning platforms on the market. In running shoe form, it’s super soft and flexible, providing spongy responsiveness and one of the plushest rides you’ll find. The basketball shoe version doesn’t feel quite the same, although it’s still softer and bouncier than anything else you’ll try on today. Zoom Air, Lunarlon, and Micro G are all more firm and structured, and I still think I might prefer a heel-toe Zoom setup or Micro G midsole. But Boost is damn close to those two and I can’t really find anything bad to say about it. The midsole foam in the forefoot feels a little thin and less responsive than in the heel, but still provides good impact protection and responsiveness. Stability is taken care of by the Fitcage and low to the ground ride, and overall responsiveness is very, very good. 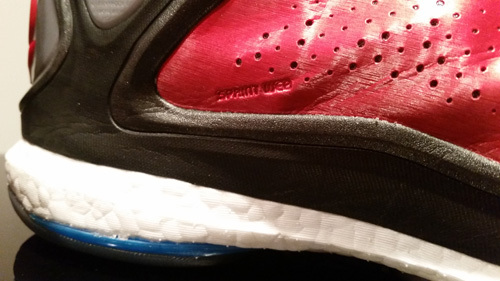 I mentioned the support plate before, and it provides plenty of arch stability and lateral stability as it slightly wraps up and around the side of the Boost foam. 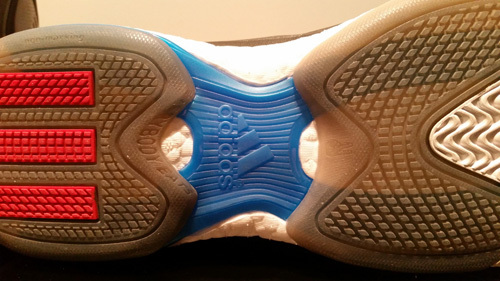 Boost is revered for its energy return, and it doesn’t disappoint. I’m not sure if I’m ready to put it ahead of Zoom Air, but adidas finally has a hoops cushioning platform (although they HAD a great thing going with Supernatural Creator-era FYW) that can compete with Zoom and Micro G.
The toe half of the forefoot is pretty traditional solid rubber, wavy herringbone and provides good stopping ability on most floors. The middle half of the forefoot and heel portions are a translucent rubber with a nubby pattern. On semi-dusty floors, I found myself needing to swipe to get great traction, but on most good floors you’ll be fine. Very good, not quite great, overall. If you’re someone that cares about creasing, you won’t like these. The speed at which they crease hurts the Rose 5’s appeal as an off-court option – although that’s not what it’s built for anyway. I see the upper holding up extremely well, as it’s sturdy and tough from any angle. I did get mine stepped on in a Saturday morning league and got a pretty nasty scuff on the side, but again it’s not affecting the performance in any way. I’ll be interested to see how Boost holds up over the long term, and whether it will lose some of that bounce and plush feel as it wears down. All cushioning eventually will get beaten down, but longevity is what I’m interested in. Given how soft it is, I imagine it will wear down some but so far, so good. Overall, I loved this shoe to be honest. It fit fantastic and checked all of the cushioning boxes: soft impact protection, good responsiveness and an extremely low to the ground feel – even if it was a little thin under the forefoot. The Fitcage frame is still probably my favorite aspect, as the lockdown it provided made it feel as secure as any shoe I’ve worn. Do I wish the upper was more natural and less stiff? Yes, but then it probably wouldn’t have worked as well with the Fitcage and may not have provided the containment needed on this platform. I think Boost lived up to and exceeded my expectations in basketball form. The Rose 5 should be one of the first shoes you try on this season, and is a shoe of the year contender alongside Nike’s KD7 and Under Armour’s Clutchfit. Great review, I can’t wait for Boost-prices to come down a bit in Europe(they’re Eur 160 = US$200) to match US-pricing more, so I can try them out too, I’ll definitely be looking for the Black-colorway, or woven-uppers though, because that’s an awful lot of creasing. That is steep – hopefully once they drop some more colors they’ll come down. Yeah it basically ruins any off court potential it has and though I didn’t really notice any drop in performance on court, I think a more natural fitting upper would be an improvement. Infinergy demonstrated retained resilience under continuous load, in a high-frequency fatigue test using dynamic loads at five cycles/s and a constant pressure of 250kPa. After 40,000 load cycles,the thickness of the test piece of E-TPU was 37mm (starting figure: 40mm). The comparator expanded polyethylene (EPE) sample remained permanently compressed and the thickness of the test piece was reduced to about 9mm. This means that Infinergy returns almost all the energy that is applied to it. Thanks for the info – great stuff. I had heard that about Boost but I guess I didn’t realize it had undergone such extensive lab testing. Longevity was one of my few concerns with it and hopefully there won’t be an issue if it performs like this. Great review. Hyperdunk 2014 or drose 5 ? Haven’t played in HD14s, but I’m not a Lunar fan. Just tried on in store but they aren’t built like the Roses. Can’t imagine liking them more than Rose 5s based on what I know. Thanks for the review JT. Good stuff. Thanks for your opinion. Sounds like both are solid choices. Curious if micro g will flatten out over time unlike the boost material. Happy holidays! I’ve always found Micro G to retain its responsiveness/impact protection for quite awhile. I think the rest of the shoe would wear down before Micro G would. 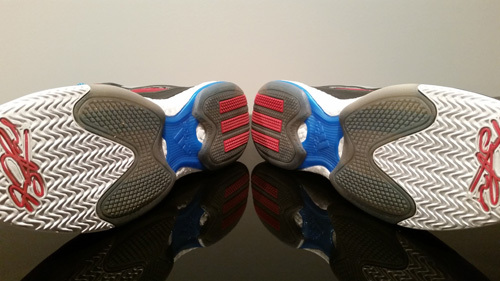 CP3.VIII review will be dropping here within in an hour – another good option if you happen to be looking for lows. Have a good Christmas man. I bought the “woven blue”, and the material have any creases, also I have to say the sneaker is really good, the cushion, traction, lockdown and court feel are the best of the shoe. Comfort is good and style it’s in you, really recommended. Glad you liked them. Materials do make a big difference with that shoe, but I still liked it in the stiffer Fuse-ish stuff on the Brenda colorway. Really locks you in, especially at the ankle with that cage. I rolled an ankle landing on someone’s foot playing in the HyperRev 2015s, went back to the Rose 5 and the stability is awesome. Wish it had a little more support underneath that Boost, but you gotta give something up for that cushioning. Hey nice review didnt saw this until now though. Was wondering if these or the clutchfit drives are better in terms of stability and support. Havent tried boost yet is it softer than micro g? And which is better overall in your opinion(whoever can help me) really hope someone can respond cause im still deciding if i should get these or not. This one was my review. 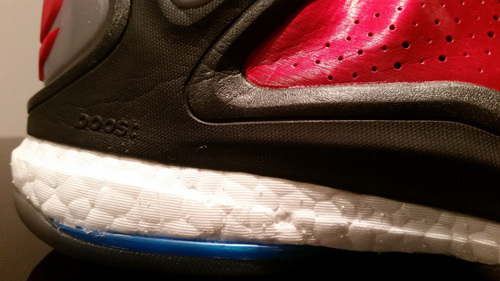 Boost is definitely softer but don’t expect it to feel like running shoe boost – rose 5 doesn’t have that kind of volume. For stability and support, both are great. If you have weak ankles the Rose 5 might feel better because the fit cage that wraps up the ankle plus the heel counter locks you in like crazy. CFD is also real secure, but doesn’t have the frame that the Rose 5 has…you’ll find mixed reviews on the Rose 5 but I love em and still hoop in em along with the Curry One. Have you tried the woven version of the rose 5’s? Seems better though and if i may ask based of my curiosity whats your favorite foam? Are you a foam or air type of person? No I haven’t but I’m guessing it solved the creasing/fit issues some people had. I personally didn’t mind the upper on that first Brenda colorway they released but I could see why some people didn’t like it. My favorite foam is Micro G. It’s firm but real responsive and seems to hold up well. I can’t stand Lunar; it wears out too quickly in my opinion and has always just felt like an average foam to me. It works fine in some shoes and I do like it in running shoes, but I’m really not a fan. Boost has some promise though, I’ve liked it in the Rose 5. I definitely like Zoom Air when it’s used right too. Depends a lot on the midsole that it’s in, but the setups in the Kobe VI, Zoom Drive, Zoom BB II, and XX8 were awesome. Outdoor wise, those two you mentioned would probably be at the top of my list but obviously those won’t work now. 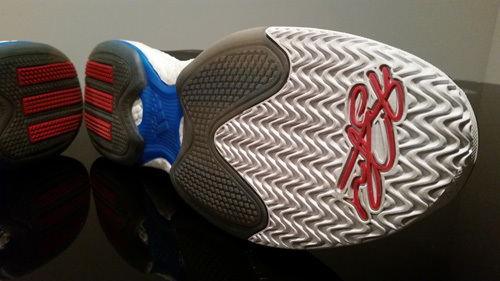 The CP3.VIII might be good outdoors, its rubber compound on the outsole is pretty solid. 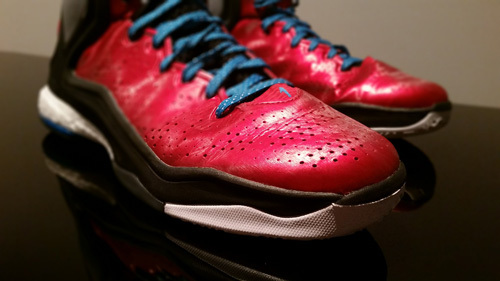 I don’t play outside much but the last couple times I’ve used either a CP3.VI/VII or some Rose 4.5s. And what maybe the best outdoor shoe out? Because the venomenons and the i get buckets are no longer available. 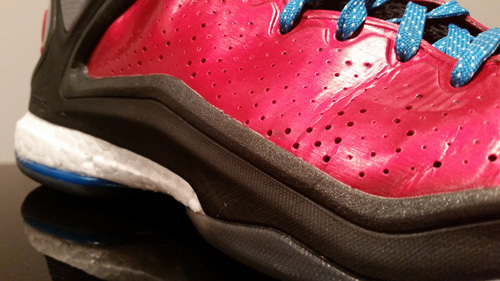 Well is the traction pattern on the rose 5’s not affected by dust much? My clutchfits have me swiping almost every time. Just wanted to ask what are the shoes in your opinion that dont get affected by dust much. Thanks for the reply BTW ill maybe get the cp3 8’s. What about the crazy 8’s or the run the ones/crusaders? Or maybe the kd 7’s? 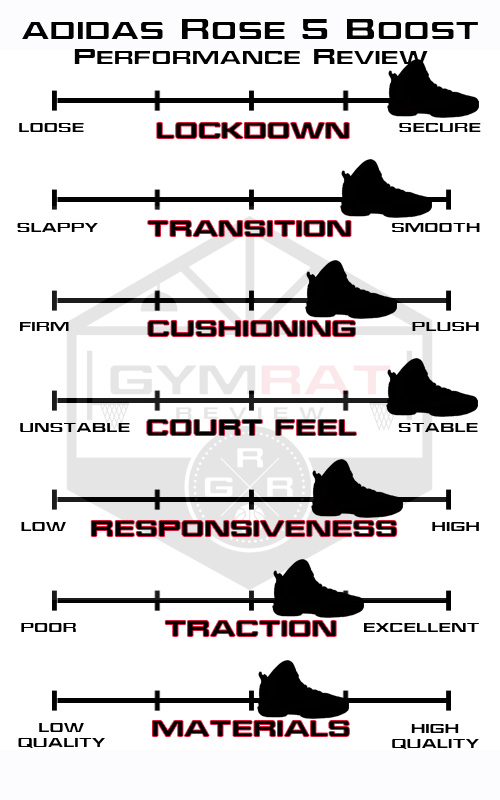 In my initial reviews, I found the ClutchFit to be pretty good on traction and the Rose 5 suffered a bit on dusty floors. After a few months now, I’m not as big a fan of the ClutchFit as it’s wore out quicker than I’d like and does attract some dust. 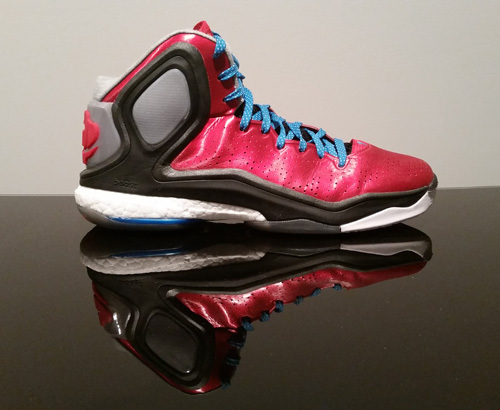 The Rose 5 has been great though, I swipe less with them than I do with the Curry/ClutchFit setup. Neither is really bad. Of those shoes, I’d go Crazy 8s outdoors. They’re tanks. Yeah I mean it just wasn’t quite as good as the pattern normally is. Still very good, just not as good as some others right now. I picked up the scarlet/black/white colorway from finishline, the one with the 3M accents on the woven part. Hey, great review. I just went back to this review to ask if anyone has been having any problem with the nubs peeling like I have. I play on rubberized courts and smooth cement courts and some of the nubs in the forefoot have chipped away.